In the field of long-term radioactive waste management, projects to construct repositories normally last from decades to centuries. Such projects will inevitably have an effect on the host community from the planning stage to the end of construction and beyond. The key to a long-lasting and positive relationship between a site and its host community is ensuring that solutions are reached together throughout the entire process. 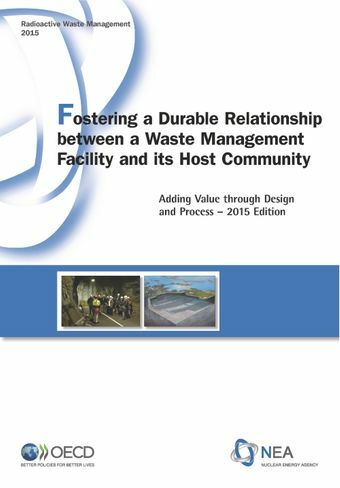 The sustainability of radioactive waste management solutions can potentially be achieved through design and implementation of a facility that provides added cultural and amenity value, as well as economic opportunities, to the local community.This second edition of Fostering a Durable Relationship Between a Waste Management Facility and its Host Community: Adding Value Through Design and Process highlights new innovations in siting processes and in facility design – functional, cultural and physical – from different countries, which could be of added value to host communities and their sites in the short to long term. These new features are examined from the perspective of sustainability, with a focus on increasing the likelihood that people will both understand the facility and its functions, and remember what is located at the site.This 2015 update by the NEA Forum on Stakeholder Confidence will be beneficial in designing paths forward for local or regional communities, as well as for national radioactive waste management programmes.